I’m barely coming up for air after this weekend’s eating frenzy. And I know I’m not alone…right? Right?? Still dreaming about this pie, though. I honestly don’t think I’ll ever make the ordinary apple pie anymore. The dulce de leche adds so much yumminess to it. And yes, it’s homemade. Easy as pie. Pun intended. 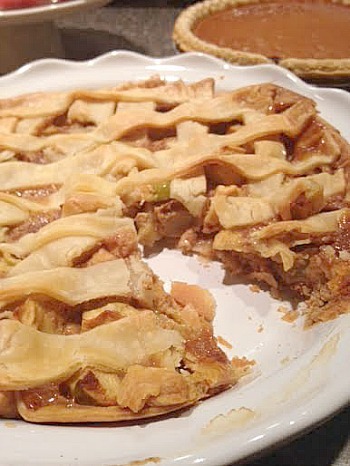 More on the homemade dulce de leche later this week – for now, just join me in my dream full of pie. Preheat oven to 400 degrees. Mix apples, dulce de leche, cider, and vanilla in a bowl. In another bowl, combine sugars, cornstarch, cinnamon, nutmeg and salt. Mix all ingredients together. Place one pie crust in a 9 inch pie plate. Top with filling and add second crust. Brush top crust with egg white mixture. Cover with foil and bake for 40 minutes. Reduce heat to 375 degrees, remove foil and bake another 30-35 minutes. Let cool. 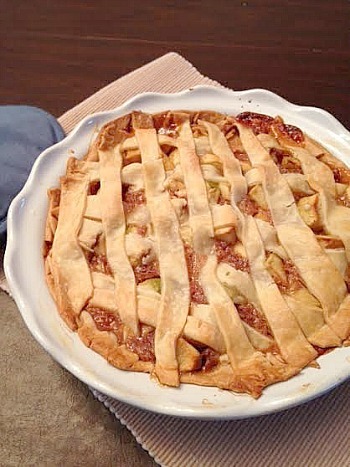 This entry was posted in dessert, fruit, pie. Bookmark the permalink.